Hi, everyone! My name is Brittany, and I'm a board member and volunteer with TownFolk and a curator at Gallery 333. Recently, I had the pleasure of creating the poster art for TownFolk's third annual Victory Festival in addition to leading the art show and silent auction portion of the event. This year's festival theme was "flora and fauna" based on the growth and abundance currently at the garden. It means a lot to me to be able to help sustain the Victory Garden, which was created in honor of Jillian Johnson's, through this yearly fundraiser. For each Victory Festival so far, Mimosa Handcrafted has donated a beautiful cuff. 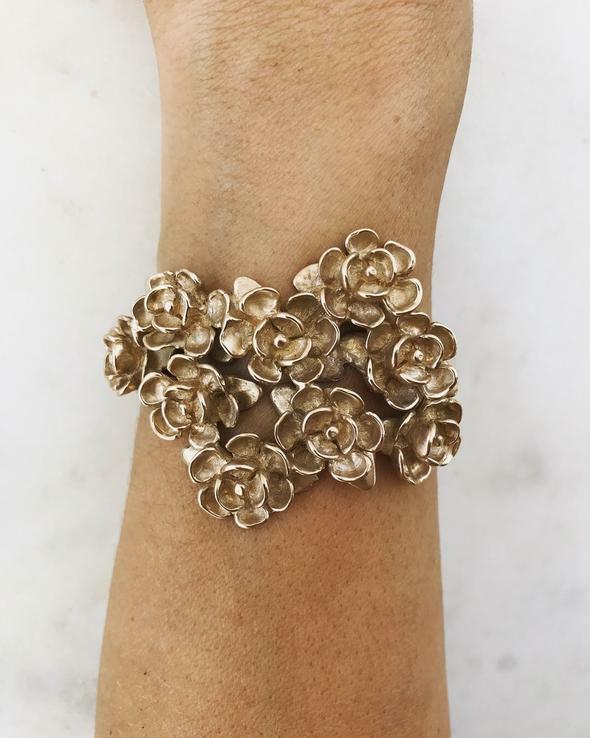 This year's Magnolia Corsage cuff perfectly fits the "flora and fauna" theme. We were touched to showcase these powerful prayer flags donated by Leah Graeff, who led the making of the flags during several community vigils in the summer of 2015. Leah's words on the installation: “These flags were created by you or someone you know. You came together on three separate occasions to grieve, support, and celebrate each other. Spend some time revisiting the pieces. Maybe you’ll laugh, maybe you’ll cry. You’ll certainly feel reconnected to your community." 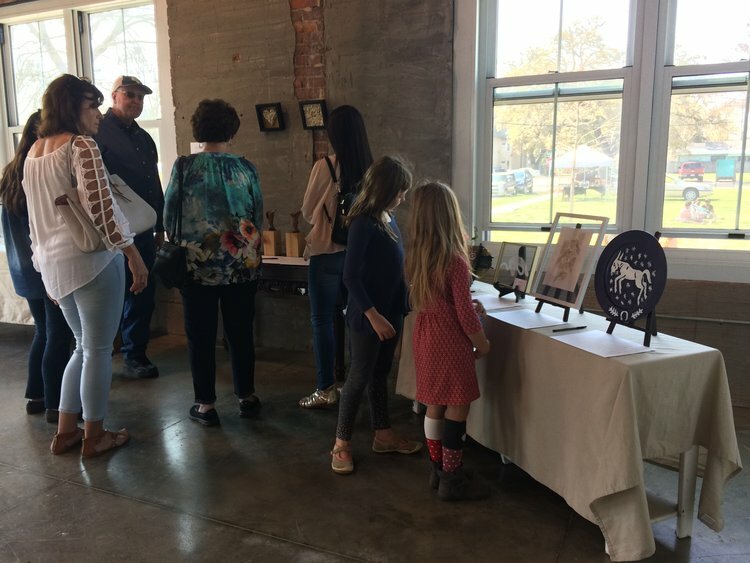 Other project collaborators on the flags include Fawn Viator Hernandez, Bree Sargent, Elizabeth Brooks, The Acadiana Center for the Arts, The Horse Farm (now Moncus Park), and Blackham Coliseum. We filled the entire back room of the gallery with rows and rows on the prayer flags. The installation room was quiet and slow-paced and offered a quiet space for guests who wanted a moment to reflect. The flags were both sad and beautiful, and stirred up a lot of emotions. We were also humbled to showcase these sentimental pieces from Jackie and Sally Johnson, Jillian's parents. 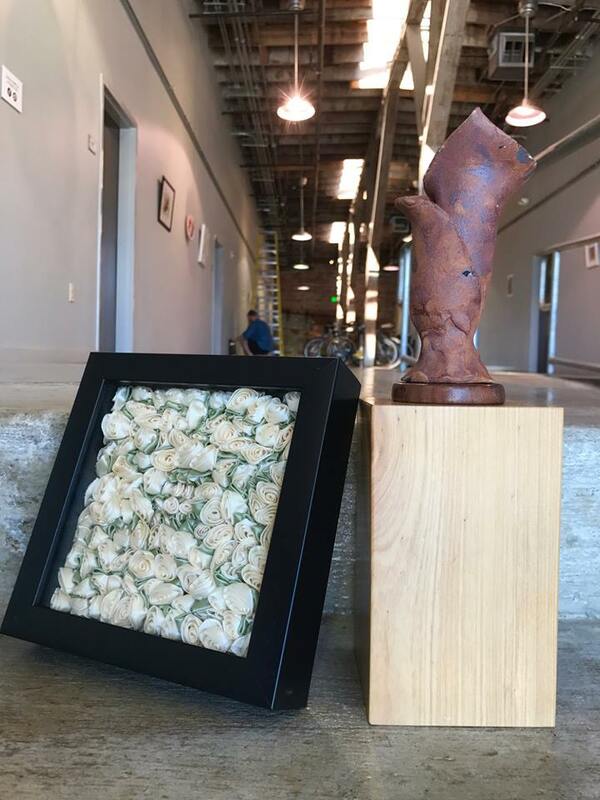 Jackie said of the pieces: "These 'rosettes' were part of a much larger assembled sculpture that was part of Jillian’s Senior Show. After the show, the larger pieces were disassembled and salvageable portions were stored away. I’ve made bases for the individual 'rosettes' from salvaged remains of cypress fence posts that I got in Nashville some 6 or so years ago. With some advice and editing from Sally, I think that Jillian would have proud to present these to the Lafayette community. Especially in service to such a good cause as TownFolk." The rosette pieces are made from Jillian's fabric scraps by Sally Johnson. For the third year in a row, we held the Victory Festival at Gallery 333 and our neighboring lots. This location makes for a spacious event space for the art show, music performances, food trucks, and vendors, and is just a block away from the Victory Garden. This video clip taken by Jacob Danos through the an open window in the gallery shows the New Natives Brass Band playing outside during the Victory Festival next to the children's play area. The Blue Runners and Sweet Cecilia also performed outside later in the afternoon. Somewhere on “the other side of town,” outside the boundaries of LaPlace, a garden is growing. Cauliflower, broccoli, cabbage, kale, sugar snap peas, and greens--mustard, collard, turnip--all lie in wait in a well-laid garden tended daily by helpful hands. Every vegetable that is harvested from this garden will find its way to LaPlace, to TownFolk Table, a weekly distribution of fresh, healthy foods to those in need. How is this possible? TownFolk Table--with its dedicated volunteers and generous weekly donations from Whole Foods Market Lafayette--has proven itself to be a successful, much-needed program, aimed at providing easy access to healthy foods to the residents of LaPlace community. There is no shortage of neighbors who come by foot, bicycle, or vehicle on Saturdays, or who wait patiently on porches for their deliveries from TownFolk Table volunteers. The only limitations for the continued success of this program are its supply of food and the challenge of meeting the growing number of those in need each week. For this very reason, it is imperative that we come together with community partners like St. Barnabas, and do everything in our power to meet the needs of those we serve. The availability of an underutilized community garden on the grounds of St. Barnabas Episcopal Church (located here in Lafayette at 200 Camellia Blvd.) has become a promising new source of fresh produce for TownFolk Table. St. Barnabas’ motto--”A Seat at that Table” conveys the church’s hope that all who enter there feel welcome and find a kind of nourishment. Similarly, TownFolk Table offers literal nourishment for their folks in the LaPlace neighborhood. With a commitment of support from its congregation, St. Barnabas was eager to offer up their hands and hearts, and the upcoming bounty from their newly revived community garden. Volunteers from both organizations recently came together for the St. Barnabas Community Garden Clean Up and Fall Planting, bringing this dream one step closer to fruition. The prospect of a long-term additional or supplementary source for TownFolk Table is exciting, and we are truly grateful to St. Barnabas for their support. In working with St. Barnabas to produce a bountiful supply of healthy food, we also see this as a wonderful opportunity to build relationships with others who live outside our neighborhood boundaries. It is through such efforts--TownFolk reaching out and beyond--that we can reintroduce the Lafayette community to the wonderfully diverse and unique community that is LaPlace. When driving by, it's easy to see the obvious food access role the Victory Garden plays in our neighborhood. People can often be seen picking beans and herbs for the night, meeting a neighbor for the first time, catching up with an old friend, or at TownFolk Table on Saturdays, distributing food to build a stronger, healthier community. But when we take a closer look, there's an amazing story unfolding on a small scale. That's exactly what local business owner and fellow TownFolk member Marcus Descant is setting out to teach right here in our neighborhood. His latest initiative is called "Bug Camp" and it teaches gardeners old and young about what exactly those little critters are doing in the garden. Marcus had a key role in the design and construction of the Victory Garden. According to Marcus, "Portions of it were designed for building populations of butterflies and other pollinators as well as predatory insects. These insects help us, they improve yield and manage pests." He also notes that at the moment, "Gulf fritillary caterpillars are mindless eating-machines packing on more than 1000 times their initial body mass in less than 2 weeks. The assassin bug population is especially high right now, so hopefully we'll get to see a knarly insect death unfold right before our eyes. The group at Bug Camp will look for a number of different bugs in the garden, identify their roles, and work on improving beneficial insect populations. This can be achieved by planting certain flowers and herbs throughout the garden. The best gardens and communities are diverse ecosystems." Join Marcus of the Urban Naturalist for Bug Camp, where part of the camp will take place at the Victory Garden, June 27th—June 30th to learn more about the crucial role of bugs in the ecosystem. View his event page here. TownFolk Table is Up and At 'Em! Recently we partnered with Whole Foods Market and their Whole Cities Grant to implement a new project in the LaPlace neighborhood: TownFolk Table! During TownFolk Table, we receive fresh donated produce from Whole Foods Market to distribute to residents of the LaPlace neighborhood every Saturday morning at the Victory Garden. In conjunction with distributing at the garden, we also deliver to a list of elderly and homebound neighborhood residents. We recently completed our first two months of TownFolk Table; the start of this project has really been a learning experience for us. During our first two months, we have been able to use the grant money to purchase our TownFolk Table trailer, develop our logo, and get the word out about the project to residents and volunteers. So far this project has really helped us to physically connect more with our LaPlace neighbors. We have met so many new people through this project, and we are now beginning to see familiar faces return for produce each Saturday. We are so thankful to be able to give back through this service project and connect with more people!